Southampton vs Liverpool: Liverpool will be hoping to move back to the top of the Premier League table when they travel to St Mary’s on Friday night to face a resurgent Southampton. The Reds scored yet another late winner last time out, this time against Tottenham as they ran out 2-1 victors. A late own goal from Toby Alderweireld handed them the points, to keep them on track with Manchester City at the league’s summit. It was the first time in 12 matches Sadio Mane wasn’t on the scoresheet. The Malian has been in red hot form, leading the way in Liverpool’s bid for a first ever Premier League title. Despite netting 20 goals this season, Mohamad Salah’s recent form could give Jurgen Klopp cause for concern. The Egyptian winger is now eight games without a goal, which is his worst run in a Liverpool shirt. On the road, the Reds have won just one of their last four away league games, although three of those have been draws. It’s those dropped points which have handed the initiative to City, as opposed to their record at ‘fortress’ Anfield. Southampton took a massive step to securing their Premier League status for another year, beating Brighton 1-0 at the Amex on Saturday. That win leaves the Saints 16th in the table, but they now hold a five-point lead over Cardiff City, with a game in hand. With Fulham and Huddersfield both relegated, it looks like a four-team battle to avoid that final spot. However, of the four sides, it’s Ralph Hasenhuttl’s men who are in the best form, winning three of their last five fixtures. At home, they’ve only lost one of their last five fixtures, winning their last two, which included an impressive victory over Tottenham. Liverpool should reference that result as a warning sign, otherwise, they could see themselves on the wrong side of an upset. Paul Tierney is the referee for this fixture. The Englishman has officiated 31 top-flight matches this season. In that time, he has accumulated an average booking points total of 37.9. Therefore, I would advise a maximum of 50+ total points for this fixture. If Liverpool were to drop points, it would really open the chance for Manchester City to claim a second consecutive title. I wouldn’t be shocked to see Southampton get something, they’re in good form, especially at home. I’m going to back Klopp’s side to just edge this one, but don’t be shocked if it ends all square. 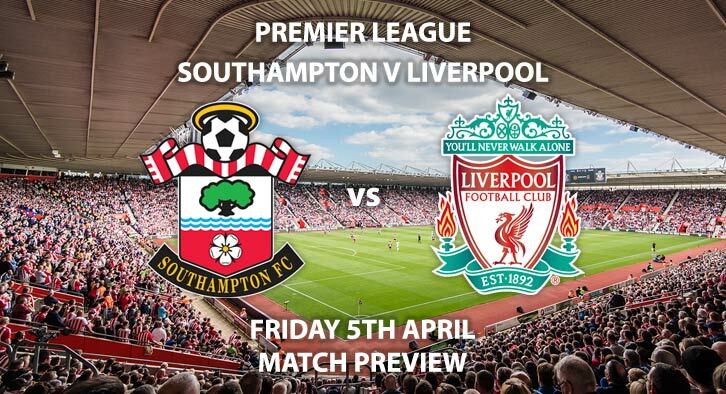 Southampton vs Liverpool will be televised live in the UK on Sky Sports Premier League with kick-off at 20:00 GMT. Correct score: Liverpool to win 2-1 – (link no longer available). First Goalscorer – Sadio Mane – (link no longer available). Both Players to Score – Roberto Firmino and Nathan Redmond to both score – 16/1. Correct Score Group Betting – James Ward-Prowse to score outside the area – 18/1. RequestABet Specials Up to 10/1 – Mane to score, 4+ 1st half corners and Liverpool / Liverpool HT/FT – 7/2. (NAP). Popular Player Stats RequestABets – Ward-Prowse to score from outside the area and Liverpool to miss a penalty – 200/1. (Outside Bet). Popular RequestABets – Southampton to win, BTTS, 4+ corners each team and 20+ booking points each team. (Outside Bet 2). RequestABet Specials Up to 10/1 – Liverpool to score 2+ goals, 5+ Liverpool corners and 20+ Southampton booking pts – 15/8. Odds and markets last updated on Friday 5th April 2019 @18:50 GMT. Keep checking back to see if there’s any updates to markets – the time stamp in the previous sentence for when we update tips on this page will be updated.